What are hyperthyroidism symptoms and signs? What is the difference between hyperthyroidism and hypothyroidsm? What tests are used for the diagnosis of hyperthyroidism? What should I do if I think I have hyperthyroidism? Which types of doctors treat hyperthyroidism? Hyperthyroidism (excessive thyroid hormone) is a condition in which there is an excessive amount of thyroid hormones. Thyroid hormones regulate the metabolism of the cells. Normally, the rate of thyroid hormone production is controlled by the brain from the pituitary gland, which is in turn regulated by the hypothalamus. Graves' disease is the most common cause of hyperthyroidism, and can be associated with eye disease (Graves' opthalmopathy). Many other health problems can cause an overactive thyroid, for example, thyroiditis or taking too many thyroid hormones. Treatments for hyperthyroidism include antithyroid medications, radioactive ablation, and surgery. There is no conclusive evidence that a special diet will help hypothyroidism symptoms; however, your doctor may recommend a diet low in iodine if you are going to have radioactive iodine treatment. Hyperthyroidism is a condition in which an overactive thyroid gland is producing an excessive amount of thyroid hormones that circulate in the blood. ("Hyper" means "over" in Greek). Thyroid hormones include thyroxine (T4) and triiodothyronine (T3). T3 is actually the most active thyroid hormone. Much of the T4 is converted to T3 in the bloodstream. 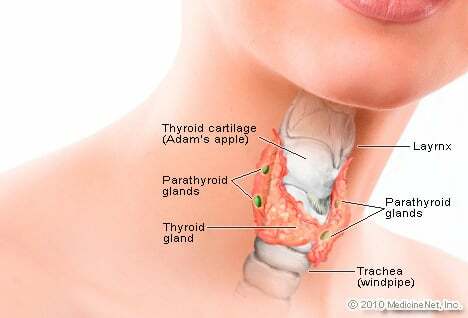 The thyroid gland is a butterfly-shaped gland located in the front of the neck. The thyroid gland itself is regulated by the pituitary gland in the brain, and the pituitary gland is regulated by the hypothalamus, another gland in the brain. Thyrotoxicosis is a toxic condition that is caused by an excess of thyroid hormones from any cause. Thyrotoxicosis can be caused by an excessive intake of thyroid hormone or by overproduction of thyroid hormones by the thyroid gland. Several signs and symptoms of hyperthyroidism due to any cause may indicate the problem; however, hyperthyroidism due to any cause is suggested by several signs and symptoms; however, people with with mild disease usually so not have experience no symptoms. People 70 years of age and older may not have any symptoms and signs of hyperthyroidism. In general, the symptoms become more obvious as the degree of hyperthyroidism increases. The symptoms usually are related to an increase in the metabolic rate of the body. In older people, irregular heart rhythms and heart failure can occur. In its most severe form, untreated hyperthyroidism may result in "thyroid storm," a condition involving high blood pressure, fever, and heart failure. Mental changes, such as confusion and delirium, also may result. Hyperthyroidism refers to an increased production of thyroid hormone by the thyroid gland, while hypothyroidism refers to a condition in which a person has too little thyroid hormone or underproduction of thyroid hormones. Graves' disease, which is caused by a generalized overactivity of the thyroid gland, and is the most common cause of hyperthyroidism. In this condition, the thyroid gland usually has lost the ability to respond to the normal control by the pituitary gland via TSH (renegade). Graves' disease is hereditary and is up to five times more common among women than men. Graves' disease is thought to be an autoimmune disease, and antibodies that are characteristic of the illness may be found in the blood. These antibodies include thyroid stimulating immunoglobulin (TSI antibodies), thyroid peroxidase antibodies (TPO), and TSH receptor antibodies. Signs and symptoms of Graves’ disease include those of hyperthyroidism; however, Graves’ disease may be associated with eye disease (Graves' opthalmopathy) and skin lesions (dermopathy). Opthalmopathy can occur before, after, or at the same time as the hyperthyroidism. Early on, it may cause sensitivity to light and a feeling of "sand in the eyes." The eyes may be reddened and produce excess tears. Swelling behind the eyeballs causes the eyes to protrude, and double vision can occur. The degree of opthalmopathy is worsened in those who smoke. In addition to the symptoms of hyperthyroidism mentioned above, Grave's disease may be associated with eye disease (Graves' opthalmopathy) and skin lesions (dermopathy). Opthalmopathy can occur before, after, or at the same time as the hyperthyroidism. Early on, it may cause sensitivity to light and a feeling of "sand in the eyes." The eyes may be reddened and produce excess tears. Swelling behind the eyeballs causes the eyes to protrude, and double vision can occur. The degree of opthalmopathy is worsened in those who smoke. The course of the eye disease is often independent of the thyroid disease, and steroid medications may be necessary to control the inflammation that causes the opthalmopathy. In addition, surgical intervention may be required. The skin condition (dermopathy) is rare and causes a painless, red, lumpy skin rash on the front of the legs. infectious organisms such as viruses. Graves' disease can be diagnosed by a standard, nuclear medicine thyroid scan, which shows diffusely increased uptake of a radioactively labeled iodine. In addition, a blood test may reveal elevated TSI levels. Inflammation of the thyroid gland may occur after a viral illness (subacute thyroiditis). This condition is associated with signs and symptoms of fever and sore throat , often with painful swallowing. The thyroid gland is also tender to touch. There may be generalized neck aches and pains. Inflammation of the gland with an accumulation of white blood cells known as lymphocytes (lymphocytic thyroiditis) may also occur. In both of these conditions, the inflammation leaves the thyroid gland "leaky," so that the amount of thyroid hormone entering the blood is increased. Lymphocytic thyroiditis is most common after a pregnancy and can actually occur in up to 8% of women after delivery. In these cases, the hyperthyroid phase can last from 4 to 12 weeks and is often followed by a hypothyroid (low thyroid output) phase that can last for up to 6 months. The majority of affected women return to a state of normal thyroid function. Thyroiditis can be diagnosed by a thyroid scan. As we age, lumps or nodules may form in the thyroid gland. Usually, these lumps do not produce thyroid hormones and require no treatment. Occasionally, a nodule may become "autonomous," which means that it does not respond to pituitary regulation and produces thyroid hormones independently. This becomes more likely if the nodule is larger than 3 cm. When there is a single nodule that is independently producing thyroid hormones, it is called a functioning nodule. If there is more than one functioning nodule, the term toxic, multinodular goiter is used. Functioning nodules may be readily detected with a thyroid scan. Taking too much thyroid hormone medication is actually quite common. Excessive doses of thyroid hormones frequently go undetected due to the lack of follow-up of patients taking their thyroid medicine. Other persons may be abusing the drug in an attempt to achieve other goals such as weight loss. A tumor in the pituitary gland may produce an abnormally high secretion of TSH (the thyroid stimulating hormone produced by the pituitary gland). This leads to excessive signaling to the thyroid gland to produce thyroid hormones. This condition is very rare and can be associated with other abnormalities of the pituitary gland. To identify this disorder, an endocrinologist performs elaborate tests to assess the release of TSH. The thyroid gland uses iodine to make thyroid hormones. An excess of iodine may cause hyperthyroidism. Iodine-induced hyperthyroidism is usually seen in patients who already have an underlying abnormal thyroid gland. Certain medications, such as amiodarone (Cordarone), which is used in the treatment of heart problems, contain a large amount of iodine and may be associated with thyroid function abnormalities. A blood test can confirm the diagnosis of hyperthyroidism. Usually, in hyperthyroidism or overactive thyroid, blood levels of thyroid hormones are elevated. However, there is one exception. If the excessive amount of thyroid hormone is due to a TSH-secreting pituitary tumor, then the levels of TSH will be abnormally high. This uncommon disease is known as "secondary hyperthyroidism." Although the blood tests mentioned previously can confirm the presence of excessive thyroid hormone, they do not point to a specific cause. A combination of antibody screening (for Graves' disease) and a thyroid scan using radioactively labeled iodine (which concentrates in the thyroid gland) can help diagnose the underlying thyroid disease. Graves' disease is almost certain if there are obvious signs and symptoms that affect they eyes. Tests for hyperthyroidism are based on an individual basis. The options for treating hyperthyroidism include, treating the symptoms of the condition with medications, antithyroid drugs, radioactive iodine, and surgery. Medications that immediately treat hyperthyroidism symptoms caused by excessive thyroid hormones, such as a rapid heart rate, include beta-blockers, for example, propranolol (Inderal), atenolol (Tenormin), and metoprolol (Lopressor). A doctor determines which patients to treat based on a number of variables including the underlying cause of hyperthyroidism, the age of the patient, the size of the thyroid gland, and the presence of coexisting medical illnesses. There are medications available to immediately treat the symptoms caused by excessive thyroid hormones, such as a rapid heart rate. One of the main classes of drugs used to treat these symptoms is the beta-blockers [for example, propranolol (Inderal), atenolol (Tenormin), metoprolol (Lopressor)]. These medications counteract the effect of thyroid hormone to increase metabolism, but they do not alter the levels of thyroid hormones in the blood. A doctor determines which patients to treat based on a number of variables including the underlying cause of hyperthyroidism, the age of the patient, the size of the thyroid gland, and the presence of coexisting medical illnesses. There are two main antithyroid drugs available for use in the United States to treat hyperthyroidism, methimazole (Tapazole) and propylthiouracil (PTU). The major risk of these medications is occasional suppression of production of white blood cells by the bone marrow (agranulocytosis). (White cells are needed to fight infection.) It is impossible to tell if or when this side effect is going to occur, so regular determination of white blood cells in the blood are not useful. Rarely, methimazole or propylthiouracil may cause fever, sore throat, or other signs of infection. If you develop these symptoms, contact your doctor immediately. Usually, long-term antithyroid therapy is only used for people with Graves' disease, since this disease may actually go into remission under treatment without requiring treatment with thyroid radiation or surgery. If treated from one to two years, data shows remission rates of 40%-70%. When the disease is in remission, the gland is no longer overactive, and antithyroid medication is not needed. Studies also have shown that adding a pill of thyroid hormone to the antithyroid medication results in higher remission rates. This type of therapy remains controversial, however. When long-term therapy is withdrawn, patients should continue to be seen by the doctor every three months for the first year, since a relapse of Graves' disease is most likely in this time. If a patient does relapse, antithyroid drug therapy can be restarted, or radioactive iodine or surgery may be considered. Radioactive iodine is given orally (either by pill or liquid) on a one-time basis to ablate a hyperactive gland. The iodine given for ablative treatment is different from the iodine used in a scan. Radioactive iodine is given after a routine iodine scan, and uptake of the iodine is determined to confirm hyperthyroidism. There are no widespread side effects with this therapy. Usually, more than 80% of patients are cured with a single dose of radioactive iodine. It takes between 8 to 12 weeks for the thyroid to become normal after therapy. Permanent hypothyroidism is the major complication of this form of treatment. While a temporary hypothyroid state may be seen up to six months after treatment with radioactive iodine, if it persists longer than six months, thyroid replacement therapy usually is begun. Pregnant women and children who have major adverse reactions to antithyroid medications. People with very large thyroid glands and in those who have symptoms stemming from compression of tissues adjacent to the thyroid, such as difficulty swallowing, hoarseness, and shortness of breath. Partial thyroidectomy (removal of a portion of the thyroid gland) was once a common treatment for hyperthyroidism. The goal is to remove the thyroid tissue that was producing the excessive thyroid hormone. However, if too much tissue is removed, an inadequate production of thyroid hormone (hypothyroidism) may result. In this situation, thyroid replacement therapy is started. The major complication of thyroid surgery is disruption of the surrounding tissue, including the nerves supplying the vocal cords and the four tiny glands in the neck that regulate calcium levels in the body (the parathyroid glands). Accidental removal of these glands may result in low calcium levels (hypercalcemia) and require calcium replacement therapy. If you are concerned that you may have an excess amount of thyroid hormone, you should mention your symptoms to your doctor. A simple blood test is the first step in the diagnosis. From there, both you and your doctor can decide what the next step should be. If treatment is needed, it is important for you to let your doctor know of any concerns or questions you have about the options available. Remember that thyroid disease is very common, and the diseases that cause an excess of thyroid hormones can be easily diagnosed and treated. Endocrinologists are specialists in diagnosing and treating hormonal disorders such as hyperthyroidism. Primary care physicians, including family practitioners and internists, may also be involved in treating patients with hyperthyroidism. Ophthalmologists and ophthalmic surgeons may be involved in the care of patients with Graves' disease. What was your treatment for hyperthyroidism?